Facebook Messenger recently got some real nice updates that makes it a better instant messaging app than before. It could even compete with the likes of Whatsapp and others. Last week, we told you about a nice little tweak for Whatsapp that lets you quickly reply to texts from anywhere in iOS. Now, there’s a similar tweak for Facebook Messenger as well. 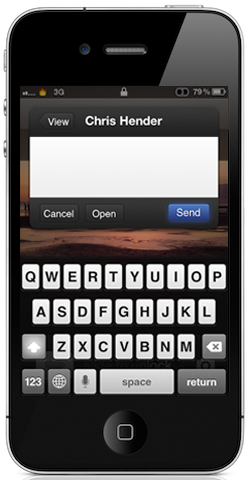 Quick Reply for Messenger is a new Cydia tweak that lets you reply to Facebook Messenger messages from anywhere in iOS. Be it from the lockscreen, homescreen, in-app, which can be quite helpful when you’re reading or playing a game and a new Message pops up. Instead of opening the app, reply, close app and then switching back to the previous app, you can just reply from within the app. Install the tweak, respring, connect to Facebook from the Settings app and you’re ready to go. Now, whenever you get a notification from Facebook Messenger, you will not have to open the app to reply. Try out the tweak and let us know what you think. Quick Reply for Messenger is currently available in the BigBoss repo for $1.99. You can, however, install this tweak and try it out for three days. Also, if you’ve purchased Twitkafly, then you’ll get to buy this tweak for only $0.99.